Please note that if you wish to use a PD drive for anchoring, an Energy Control Valve (ECV) must be fitted for the warranty to be valid. 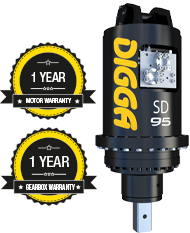 If you're looking for industry leading performance and reliability, with engineering back up, & experienced service you can count on, look no further than Digga for all your Screw Anchor Drive needs. Our reputation has been built over 31 years of product quality and customer service.